I honestly had no idea what to expect. Would the roads still be flooded? Is it dangerous? The news made Houston look like a war zone. What was I about to get myself into? What I quickly learned was no different from what I learned on the Jewish Federation’s National Young Leadership Cabinet’s recent study mission to India: Houston is currently a tale of two cities. One side of the street is sunny and incurred no damage, the other side devastated and eerily resembling the slums. Luck decided which flooded and which remained dry. Our group of Cabinet members had flown in from all parts of the country. We started early Friday morning at the Jewish Federation of Houston’s office, where the professional leadership team warmly welcomed us. Piles of boxes from the NYL Cabinet Amazon Prime wish list filled the lobby. The items trucked in from Dallas and those directly shipped to Houston were immediately dispersed. 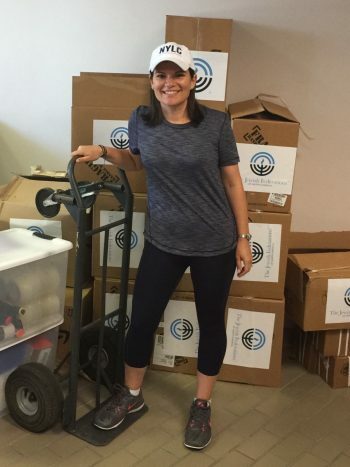 Diapers, toiletries, packing and cleaning supplies were given out to thousands of members of Houston’s Jewish community who have been displaced, as well as to their local agencies for additional distribution. Each day more and more Amazon Prime packages arrive and they are so thankful for our generosity. A local Orthodox rabbi stopped by in his pickup truck and shared with us his efforts to deliver hot kosher meals to elderly Jews stuck in their homes. He explained that it had taken almost a week for the roads to open and for him no longer to deal with bumper-to-bumper traffic. Smiling, he said that it didn’t matter how long he had to sit in traffic; these members of his extended Jewish family needed a hot meal each day. First-year Cabinet members Haley Trager (Jacksonville) and Ben Lyons (Central Massachusetts) both hand-delivered checks and gift cards from their local communities. Every dollar will make a difference. We were told it will take an estimated $30 million to rebuild the Houston Jewish community and only one-third of that has been raised thus far. The community is hopeful that the outpouring of generosity will continue in the coming months. We then hit the road for a driving tour of Meyerland and Bellaire, two of Houston’s most popular Jewish residential neighborhoods. Home after home, street after street, block after block, tree lawns were covered in trash. Furniture, drywall, flooring, bags of clothes, photos. People’s entire lives sitting on their tree lawns waiting for the dump truck. With so many of these home outside the flood zone, homeowners do not have flood insurance. Small bungalows to giant mansions – the flood waters hit every corner of these beautiful Houston suburbs. The JCC organized a Shabbat celebration for all the volunteers and staff that Friday afternoon. Arm-in-arm, they smiled and cried together as they sang the mishabeyrach, praying for a better tomorrow. The rabbi shared the story of the destruction of the Temple and the resilience of the Jewish people. She commended them for all their hard work and determination to rebuild their community. Some of these volunteers lost their own homes, yet continue to come out and volunteer every day to rebuild their Jewish community. We toured Beth Yeshurun, Houston’s largest Conservative synagogue (the nation’s third largest) with close to 10,000 members. Walking through the parking lot, we saw clear trash bags filled with prayer books. Thousands of siddurim and chumashim were damaged by the flooding and had been set aside to be ritually buried. The inside of the shul was a mess. The main sanctuary’s seating was under water, the carpet and seating destroyed. In one room, all the archives were laid out to dry in the hopes of saving old confirmation class photos and historical synagogue documents. Classrooms were cleared out of the day school attached to the synagogue, construction workers ripping out walls and flooring as the recently remodeled school now needs to be rebuilt again. Our final task was delivering challahs to Jewish residential homes in the area. One family shared with us their journey throughout the last week and a half. Their house had never flooded before and they have now lost everything. The homeowner ended our visit by thanking us over and over. She said Federation support has been simply overwhelming. Offers to help clean out her home, food deliveries, and endless emotional support during such a difficult time make such a huge difference. As I flew home to Cleveland, I left with even more questions than when I arrived. While the water has receded and the roads are now clear, how could a community remain so positive after so much tragedy? Houston isn’t dangerous, it’s powerfully resilient and the optimism is truly contagious. Jews from all sides are coming together to rebuild and be there for one another. To give hugs, send meals, rip out drywall – you name it, they’ll do it. Houston defines the essence of community and what it means to stand up and move forward. As we walked through the day school hallways, I had noticed a poster with a quote from Rabbi David Rosen: “Accept what you cannot change, change what you cannot accept.” Houston had no way of avoiding Hurricane Harvey and the massive rains that followed. Its residents sat back and watched their homes drown and there was nothing they could do to change it, but they refused to let the devastation keep them down. The Torah portion the Shabbat I returned home was Nitzavim-Vayelech, meaning to stand up and move forward. This is Houston. Its residents stood up from the destruction and they are moving forward. They will rebuild. They will not only survive, but they will thrive. The Jewish Federation of Houston will make this happen. It is the central source for all the needs in the community and will make sure to address the needs as they arise. As individuals, we will never know about all the individual needs in Houston. How many elderly people who need hot meals, preschool teachers who need new books, or individuals who lost everything and now need financial assistance. Federation will always know. Thank you Houston for inspiring the rest of the world to do more, give more, be more. We will stand up. We will move forward – together. Michelle L. Hirsch is Co-Chair of The Jewish Federations of North America’s National Young Leadership Cabinet and Senior Vice President of Brunswick Companies. She lives in Cleveland with her husband and two children.